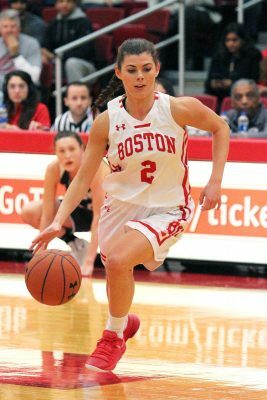 The Boston University women’s basketball team kicked off their second half of Patriot League play at home Saturday afternoon against top-ranked conference foe Bucknell. Despite a 17 point comeback in the second half and a brief lead in the fourth quarter, the Terriers (10-10, 6-4 Patriot League) fell to the Bison (18-4, 9-1 Patriot League) 58-62. BU head coach Marisa Moseley said the team’s performance in the second half and specifically the third quarter was better than their effort in the first. The opening quarter started out physical with both teams pounding the ball in the paint, but both stood strong against these inside shot attempts. After a timeout six minutes into the quarter, the Bison changed their offensive strategy, opting to pass to the open player on the perimeter and shoot from deep. The Terriers stuck with the inside attack led by sophomore guard Katie Nelson, who put up seven points in the opening frame. A minute-and-a-half into the second quarter, the Terriers called a timeout after Bucknell sunk two quick buckets to jump out to a 12 point lead, 23-11. Coming out of the timeout, Bucknell scored another quick three-pointer, but Terrier junior forward Nia Irving answered a minute later with an and-one layup and the ensuing free throw. Heading into halftime the Bison put up five quick points to jump out to their largest lead of the half at 15 points, 34-19. Pacing the Bison was forward Ellie Mack with 10 points at the break. Despite scoring zero points in the second quarter, Nelson still led the Terriers with seven points. In terms of shooting, BU shot only 7-for-23 from the field, including 0-for-6 from beyond-the-arc — a 30 percent conversion rate. Bucknell shot a clean 50 percent, 13-for-26. Despite being shutout in the second quarter, Nelson came out hot in the third quarter, drilling two threes. 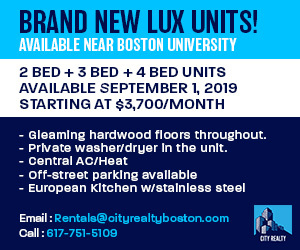 The rest of the Terriers seemed to have caught fire off from Nelson’s spark, as Bucknell’s 17 point lead was quickly cut down to nine with quick baskets from Irving, Nelson and senior forward Naiyah Thompson. Moseley said Nelson was incredible against the Bison. Going into a media timeout with two minutes left in the third quarter, BU had put together a furious rally to cut Bucknell’s lead all the way down to six points, and going into the fourth quarter the lead was cut down to five points. Nelson put up 10 in the quarter off of three 3-pointers and a free throw. It seemed as if Bucknell and BU’s accuracy was reversed during the half, as BU’s shooting greatly improved from the earlier period. The Terriers shot 7-for-8 from the field. Meanwhile, Bucknell shot only 9-for-25 from the field. The Terriers took their first lead of the game with seven minutes left to play off a three-pointer from senior guard Lauren Spearman, made possible by an assist from inside the paint by senior guard Payton Hauck. The Bison battled back to retake the lead at 56-53 with two minutes to play, but again the Terriers would not back down. Nelson was fouled at the line and converted both free throws to make it a one point game. The Bison were not done either — in a scrum under the basket, forward Kaitlyn Slagus was fouled and made both of her free throws to extend Bucknell’s lead to three points. BU would call a timeout and get the ball on the offensive half of the court, but lost possession on an inbound pass under the basket. Mack effectively iced the game for the Bison with 24.6 seconds left to play as she drained both of her free throws after being fouled off the inbound pass, making it a 60-55 game. Nelson bounced a three-pointer off the rim and the backboard that trickled in to make it a two-point game. After the ensuing inbound pass Bucknell guard Mary Walls made both of her free throws to ice the game for good as the Bison avenged their previous loss to the Terriers with a final score of 62-58. Slagus led Bucknell with a team-high 16 points, and Nelson led BU with a game-high 22 points, including three three-pointers. Irving also poured in 15 points for the Terriers. The Terriers will travel to Bethlehem, Pennsylvania, to continue conference play against Lehigh on Feb 9. Moseley said that the week off will be a huge benefit for her team.